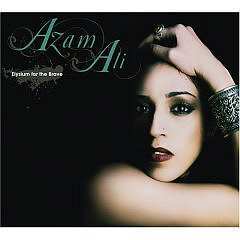 Review: "Ali, Azam: Elysium for the Brave" - Sea of Tranquility - The Web Destination for Progressive Music! Azam Ali was born in Iran, raised in India, and currently resides in the USA and she blends her polycultural influences beyond what the human mind can imagine. Known for her collaborations with a vast array of musicians, including members from Nine Inch Nails, the guitar virtuoso Buckethead, the Turkish world music composer Mercan Dede, and the Grateful Dead drummer Mickey Hart, she also fronts two amazing bands: Vas and Niyaz. Elysium for the Brave is her second solo statement, which she has co-produced with Carmen Rizzo (Niyaz) and sees her taking her already amazing style several steps further. This time around, she is supported by King Crimson's Pat Mastelotto whose amazing percussion work on the opening song "Endless Reverie", blended with Ali's impossibly beautiful vocals, is like the perfect combination of tribal beats and electronics, something we've never heard from Ali before. Another Crimson member, Trey Gunn, also appears on the album, and even co-wrote the mood-intensive piece "The Tryst", employing minimal guitar effects that underlie Ali's vocal lament. Her velvet vocals convey sensuality and heartfelt emotion, and are carefully placed atop an ethereal guitar theme. It is amazing to hear Ali sing in English -- her older fans know how moving she can get when she sings in Persian and Indian, but to see that she is actually capable of applying her talents to more "straightforward" pieces is nothing short of astounding. Unlike her works with Vas and Niyaz, there are a few non-Eastern songs on this album, such as the album opener and this one, where you'll get lost in the beauty of forlornly ringing guitar notes and dark mysticism. That said, while the titles are in English, not all of them are sung in this language. Ali still uses lots of Persian and Indian lyrics in her songs. Her artistic strength mostly lies in crafting unique Middle Eastern pieces highlighting her vocals and it is hard to capture the intensity without using the region's language and instruments (as on the Indian dirge "Abode"). Her voice is so vulnerable and beautiful I don't even know how to describe it. Having discovered her on Mercan Dede's Breath album where she does her unique Persian-styled vocal melodies mostly going for wordless harmonies, I felt compelled to seek everything she participated in and was absolutely thrilled she experiments with the same style on songs like "I Am a Stranger in This World", which she co-wrote with Loga Roman Torkian, her partner in Niyaz; and the mesmerizing "From Heaven to Dust", an atmospheric elegy drenched in western beats and Indian percussion. "In Other Worlds" is one of the darkest songs on the CD -- it contains strummed acoustic guitars that slowly disappear under a wall-of-sound keyboards that blanket everything but Ali's wonderful voice. Though there is a vague Persian sadness incorporated into the song, this is yet another attempt to branch out and explore new territories. The production and sonic quality of the album are mindblowing. An incredible amount of nuance and coherent body of work serve to heighten the unmatched emotional power of Ali's voice and compositional skills to a higher level. She has now proved that she is so much more than just a singer with a great voice; her understanding of melody, rhythm, and vocal arrangement leaves me speechless. Check this disc out even if you're remotely interested in world music that is unafraid to infuse electronics and minimalism into its tapestry.